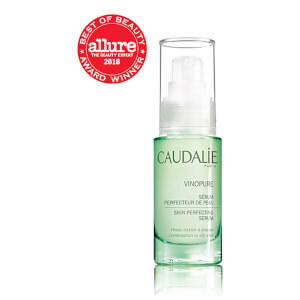 Achieve younger-looking eyes with Caudalie Premier Cru The Eye Cream, a lightweight formula that is gentle on delicate skin. The deeply nourishing eye cream melts into skin instantly to deliver noticeable anti-ageing benefits, soothing puffiness and reducing the appearance of dark circles. Hydration is replenished to smooth and firm skin, resulting in a more youthful facial structure. Infused with soft-focus pigments, the treatment imparts a radiant, natural-looking glow that leaves eyes looking brighter, wide-awake and years younger. Free from silicones and fragrances. Apply 1-2 pumps onto the eye contour in the morning and evening, then smooth outwards. Gently massage the eyelid, paying close attention to the corner of the eye. Finish by smoothing the lip contour. Aqua/Water/Eau, Coco-Caprylate/Caprate*, Ethylhexyl Stearate, Silica, Glycerin*, Butylene Glycol*, Cetearyl Alcohol*, Bis-Behenyl/Isostearyl/Phytosteryl Dimer Dilinoleyl Dimer Dilinoleate, Hydrogenated Avocado Oil*, Ci 77891 (Titanium Dioxide), Mica, Hydrogenated Olive Oil Stearyl Esters*, Caffeine*, Hydrolyzed Hyaluronic Acid*, Vitis Vinifera (Grape) Seed Oil*, Palmitoyl Grape Seed Extract*, Palmitoyl Grapevine Shoot Extract*, Sodium Carboxymethyl Beta-Glucan, Helianthus Annuus (Sunflower) Seed Oil*, Acetyl Tetrapeptide-5, Palmitoyl Tetrapeptide-7*, Citric Acid*, Cetearyl Glucoside*, Potassium Cetyl Phosphate, Tocopherol*, Tocopheryl Acetate*, Polymethyl Methacrylate, Ethylhexylglycerin, Carbomer, Caprylyl Glycol, Sodium Benzoate, Arginine, Xanthan Gum, Lactic Acid, Sodium Phytate*, Titanium Dioxide, Tin Oxide, Ci 77491 (Iron Oxides) (187/034). This product is like no other! I have tried probably 30 different eye creams, this surpasses them all. I see the fine lines fading and it hasn't even been a full month. It really is incredible. It's rich and melts in to the skin. I'm using it above my lip and those lines are fading as well. I think that between this , in combination with the Cru Serum and the daily vitamin all by Caudalie I am literally watching my skin transform. Beautiful!